This is a panel that lends itself to practice your free motion quilting skills and patterns whether you are a relative beginner or have some prior experience. I sandwiched the panel using two layers of batting. 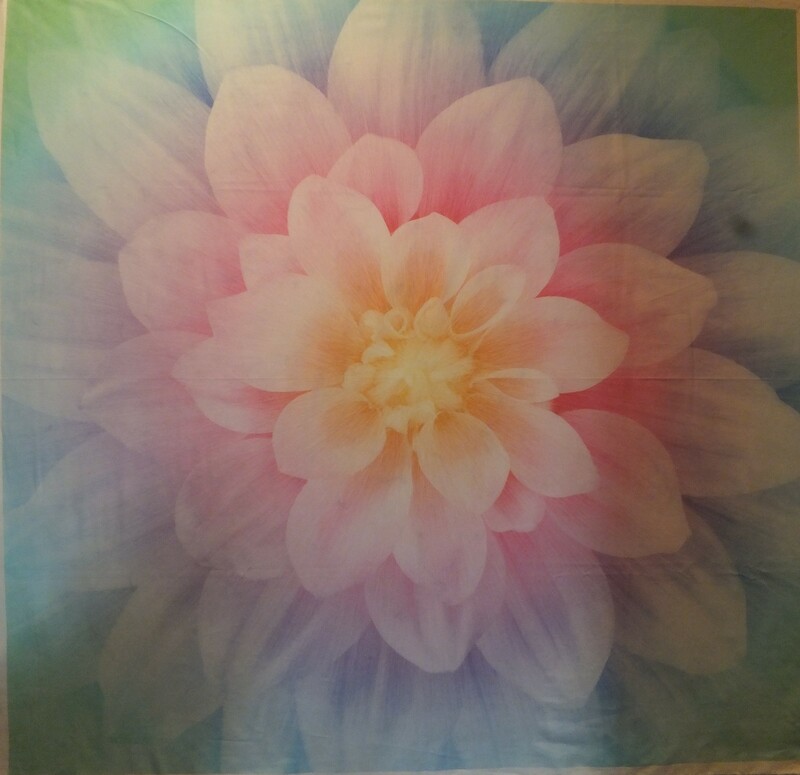 This allows the areas that you do not free motion quilt to puff up and give your flower more dimension. I used the temporary spray adhesive. Having no safety pins in the work is a bonus! I then chose three colours or shades of embroidery thread to quilt the panel. The panel changes colour or shades as you work your way out to the edges. One of your threads could be your bobbin thread throughout the project. 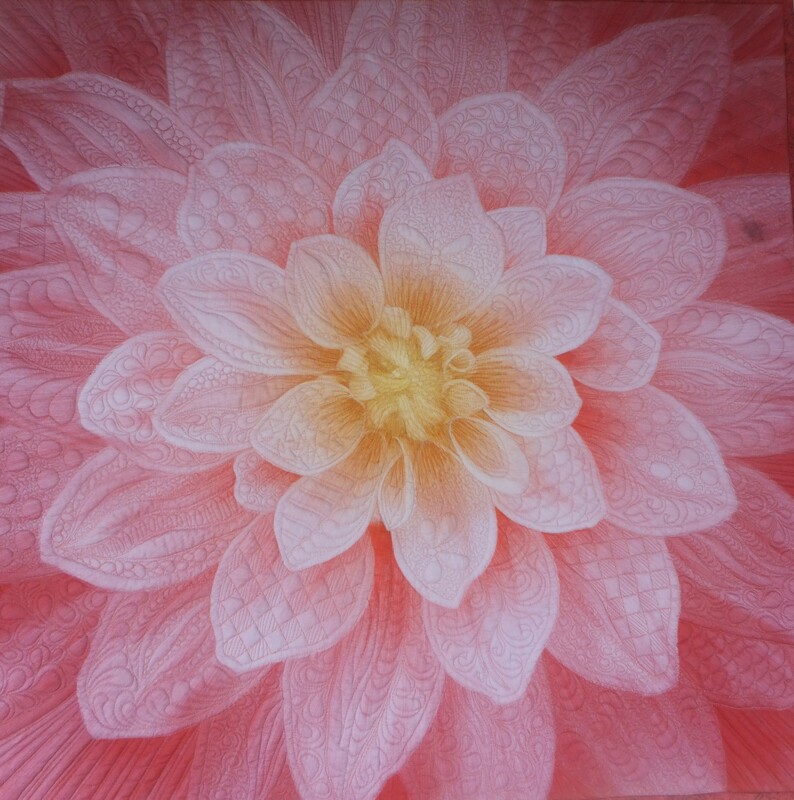 I simply outlined the petals and echoed that outline on the INSIDE of each petal. I made the echo wider as I got out to the larger petals. 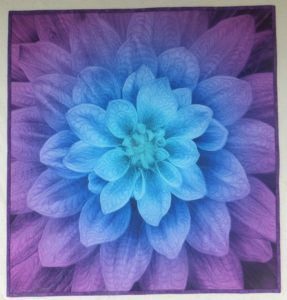 On the blue/purple panel, called AURORA, I simply played with different feathers or feather related patterns in each petal. On the pink panel, called ROSE, I played with different patterns, sometimes splitting the petal down the middle with a vein and doing a different pattern in each half. The third panel for sale is unquilted and is called, OPAL. If you look at my quilted panels you will find that they are far from perfect but I thoroughly enjoyed quilting both and found that having the small areas to quilt simply liberated my pattern choices. Just have fun girls and don’t over worry about it. Simply treat it as a practice piece and you will be surprised with the end result. Each panel comes 44″ wide and is 1 1/4 yds long. Aurora, Rose or Opal. Price $16.00 a panel and $2.00 shipping.